Marc LEFEBVRE founded V1D2 Marine Services in 1999 after 20 years of racing, boat preparation and boat building at the highest level, including key roles in a number of Vendee Globe and other high-profile ocean-racing campaigns. 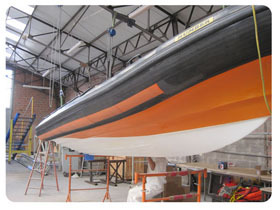 Located in Caen, Marc and his team specialise in the refit and preparation of boats, applying their years of expertise with modern composites as well as more traditional materials to delivering work of the highest standard. 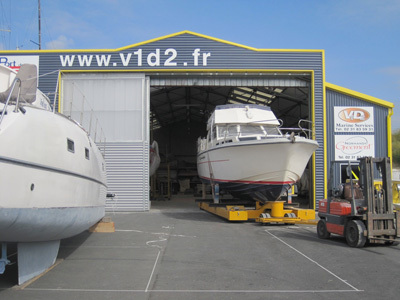 V1D2 Marine Services also provides winter lay-up and storage facilities. 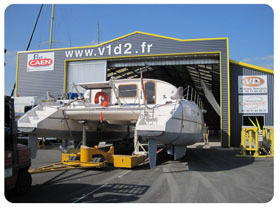 V1D2 is a boat yard with a difference, with an active policy of welcoming boats of all types and sizes, ranging from state-of-the-art ocean-racing machines, to cruising boats, to classic boats to RIBS. 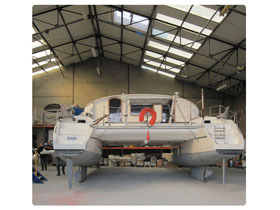 From the world of offshore racing, we are regularly called upon to prepare Open 60s, Class40s, Figaros and IRC boats, but numerous sailors of all stripes, be they racers, cruisers, round-the-world sailors etc, come to us to improve on reliability, undertake refit work or simply carry out a thorough inspection of their boats. We currently also provide technical assistance to Clare Pruvot on the Figaro circuit. We welcome cruising monohulls and multihulls, classic boats and RIBS for all types of maintenance, including repair work, hull and/or deck painting, rig inspections, systems inspections etc. We speak English, and a number of our customers are from overseas. Since 2007, NORMANDY Gréement (NORMANDY Rigging) has been applying its extensive expertise and meticulous attention to detail to all aspects of rigging work. All of our waste is removed by specialist recycling companies, Coved & Chimirec. 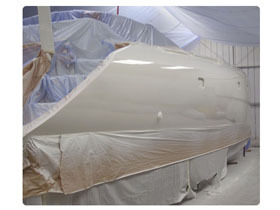 Our facility is equipped with a 25 T crane as well as several keel pits on the hard outside and in our paint workshop, capable of accommodating deep draft vessels. Boats on the water are moored in the calm basin in front of the boat yard (depth alongside: 8 metres). And lastly, our location beneath the Calix bridge in Caen is easily accessible by water, road and railway. Come visit us to see for yourself! !